On Wednesday, November 1, 2017, the Fourth Estate Restaurant will host a dinner featuring international food writer Robyn Eckhardt, author of Istanbul & Beyond, and the book's photographer, David Hagerman, and a sampling of delectable recipes and wines. This is a ticketed event. THIS IS SELLING OUT quickly. The five-course meal will be from his popular recipes. 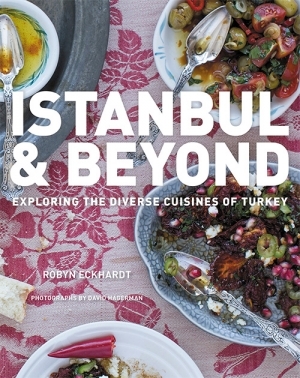 On Wednesday, November 1, 2017, International food writer Robyn Eckhardt will be featured at a Fourth Estate cookbook and wine dinner with the book’s photographer, David Hagerman celebrating Istanbul & Beyond which explores the diverse cuisines of Turkey. Eckhardt has said, “Turkey touches four bodies of water and share borders with Bulgaria, Greece, Syria, Iraq, Iran, Azerbaijan, Armenia and Georgia…this results in not a nation united by one cuisine, but an array of culinary regions that make it one of the most gastronomically complex countries anywhere.” Recipes from the book will be served paired with complimentary wines. The menu and wine pairings will be published when available. Eckhardt’ s work has appeared in The New York Times, The Wall Street Journal and Food & Wine. She is the author of the blog Eating Asia, selected as a top food blog by both Saveur and The London Times. David Hagerman, Eckhardt’s husband, has photographed food and exotic locales for Travel + Leisure, Saveur and The New York Times. The couple live in Italy. Each ticket includes a signed copy of the cookbook; couples receive one book.